Hello! Today the Hero Arts Design team is showing off some Christmas goodness using the new products from the 2014 catalog. I used Stamp & Cuts Small Joy Tags and coordinating die. The cool thing is that the die comes with the set, so you are ready to go! This card is super easy to mass produce! I love the scripty font and the shape of the tag. Giveaways - Hero Arts will be giving away one GRAND PRIZE that includes an assortment of stamps, inks, stencils and dies valued at over $75. Two $10 Hero Arts Online Store gift cards will also be awarded. The three prize winners will be randomly selected from all comments received on the participating designers' blogs, so the more comments they leave along the hop, the better their odds of winning. The giveaways will close at 11:59pm PST on Thursday, Oct 2, with the winners announced on the Hero Arts blog on Friday, Oct 3. Here is the line up for this fabulous blog hop! Never the least:0 Your card is outstanding..LOVE your signature perfect bow. Beautiful card- I'm now inspired to get crankin' on my cards for this holiday season! Love this Wida! The & in the background is perfect! Great use of the big ampersand! Wonderful card! Like how the sentiments are made & arranged with the '&' symbol. Love it .... Love it!!! So elegant , love it!!! Lovely! that and sign in the background is perfect for your hanging word tags. Great card. So happy to see coordinating stamps and dies. Here fits just one word: Beautiful!! Great design, Wida! Love it! I love the dimensions of the card. Simple but elegant. Wao! This card its stunning! Love the dimension and the elegant effect! Thanks for sharing! Sweet and simple, what more could we want? Thanks. The the beautiful simplicity of this...I really like the big embossed ampersand....and the word dies/stamps are the perfect touch. Very nice! Beautifully done - love the non-traditional colors and classic design. Gorgeous! Love the soft colors! And there's matching dies too? <3!!! The ampersand - this is the only card using the big ampersand that I've ever loved! Elegant, classy and SO stylish! Love this card, Wida! So classy! Love the CAS design and soft colors! Cool idea with the & embossing! LOVE this.... perfect colors, beautiful design! This is so different and so pretty. TFS. This is a nice, simple but very fun card. I like the large embossed ampersand. This is such a charming and creative design! I like the colors and how easy this card is to reproduce! WOW~ Love the simplicity of this card!!! its so eye catching! I love clean and simple! The colored tags just stand out! Love the added background embossing. Beautiful card!! Love how you used the embossing folder to connect your elements. Very creative. What a simple yet sweet card. Love the embossed background and the colored words. Just so sweet. Wonderful word choices.love the colors and classic look of this card. thanks for sharing. How delightful!! I especially like the embossed ampersand on the card base!! Wida, I love how untraditional your card is! So, so creative. Oh wow, this card it beautiful! Maybe my favorite! Great job! Easy and simple-yes, but put a smile on my face. Very nice! Wow! What a great card! Very different way to convey a message but has a lot of impact! Beautiful card! Love the soft colors and the simplicity of it. Very nice! This is gorgeous. I would LOVE to have this set. It's simple yet so elegant. Simple and lovely. Nicely done. I thought your choice of colors was perfect. I love the simplicity of this card-very pretty! I love the soft colors of this card and the elegant layout. Love the colors.. Really love the simplicity of this card.. I love the subtle ampersand and how it flows with the sentiment. Great card! What a great layout idea! Your card is gorgeous!! WOW!! You really did one outstanding creative job!! I read your recipe and my goodness you sure came up with one fabulous card with using so little to do it. Girl YOU so ROCK!! Love the clean background with just the embossed ampersand embossing. Love the giant ampersand it really pops your card. I love the layout of this card! It is very simple but elegant! thanks for sharing. very beautiful card! Thanks for the inspiration! Excellent dimension to this card - beautiful and simple! Oh, I love the simplicity of this card. Just lovely! so beautiful! I love the white ampersand!!! I loved your CAS card! So easy to make and very mailable! Thanks for sharing. I just the simple but beautiful design of your card. Thanks for sharing! Great card. Thanks so much. Colors, design, card -- all divine! I love the simplicity of this card!! That is one of those why didn't I think of that cards! Beautiful. Very pretty card and love how the ampersand ties it all together! Love it! How did you do the big ampersand on the card? Is that an embossing folder? Or did you find cards that were pre-embossed? It's a fabulous look! Love the clean and simple! Very pretty! Love the elegant simplicity of this card. This is one of those "why didn't I think of that" cards. Beautiful. 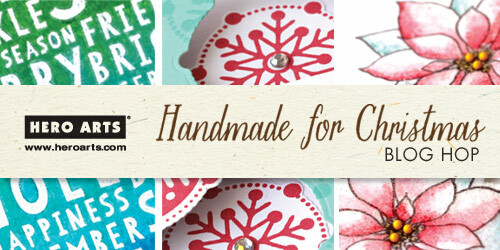 I love your clean and simple to make card, looks very easy to mass produce TFS !!! Perfect, just perfect. The embossing is the detail that makes this card stand out. Love everything about this card. Just love the colors against the white! I too love the scripty fonts and the shape of the tags. Just perfect. Love the card, very simple and classy. You had me at "ampersand". I love it! What a great card. Love that embossed ampersand. And, just in case I should win something: kmwbeads at comcast dot net. Just beautiful! I really love the ampersand and the font on the labels. Very nice card. Simple and elegant. Amazing card!! Love how CAS it is!! clean and simple but so lovely. the sentiment is great. Oooo I love this! That subtle ampersand is just right! How awesome and perfect is this?! LOVE!!! Pretty card, thanks for sharing! loving the ampersand and the colors are fabulous! love the white on white! tfs! Love your card colors selection and the de bossing of the &. Great card thanks for sharing. Very pretty card. Love it when the stamps have matching dies. Thank you. A very simple to make card that is beautiful to look at. My only question is the & is it stamped and wet embossed or a dry embossed &? I also love stamps that have matching dies. Great job thanks for sharing. Great clean, graphic card! My favorite! Great way to use something so large and not let it be overwhelming. Very nice Card. Love the Ampersand!!! Very modern chic christmas card!!!! Love the modern look of your card. Simple and clean card. Thank you for the chance to win. I love the simplicity of this design! I love how the embossed ampersand brings all the tags together!! Beautiful!! Your construct is creative and edgy. I really like the embossing on white cardstock for the background! Really makes the other elements pop. Lovely. Thanks for the opportunity to win. Just love your trio of labels, Wida! So gorgeous on the white embossed background! Such a stunning card, Wida! I love the soft color palette and your design is so pretty! I think your card is excellent. I love the clean "&" sign, the words. You are very talented. Thank you. What a great card! You're right, those scripty decorative labels are fab, and I really love the CAS style of your card. Elegant and crisp, and it makes a statement too. Thanks so much for sharing your creativity with us, and of course for the chance to win! I love clean and simple cards. This one is great. Super simple yet very appealing. Great card. This is a beautiful card. So simple yet says so much. Such a great idea to use that ginormous embossed ampersand! Genius! Thanks for sharing your wonderful card! 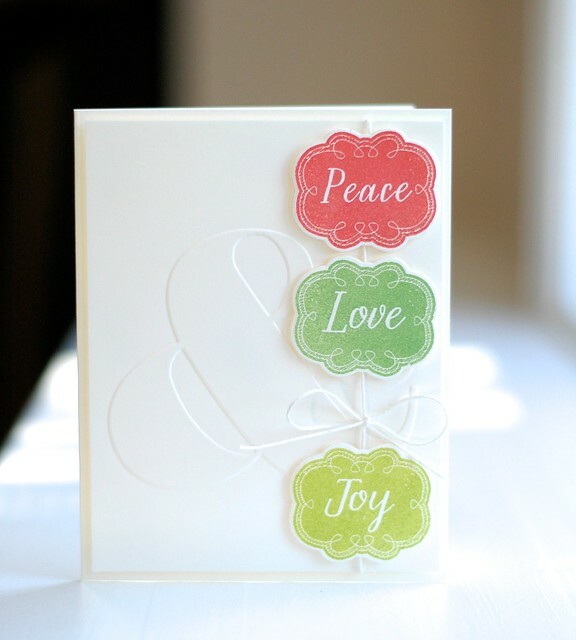 cute card, simple yet eye catching - I would never have thought to use the colors you did on a Christmas card. I love this card. The idea can be used in so many other ways, but I love the message of Love, Joy and Peace. I loved the card. It is so elegant and beautiful. My eye was drawn right to all the sayings. What a different card and so bright and cheerful. I really like it. I love the simplicity of your card - thank you for sharing! Love the way you used the ampersand. nice card using sentiment labels! This card is so pretty in its simplicity but it's also very effective! Tfs. Very simple and gorgeous! Love it! Fabulous card! Love the simplicity of the card! Love this card - the embossed ampersand in the background is the perfect complement to the sentiment labels! Beautiful! So clean and simple but filled with elegance. The embossed background is the perfect backdrop for those colorful sentiments. Great CAS card! Love the embossed background. The large ampersand with the floating joy sentiments is so fresh and unique! I like the subtle embossed background. Love the card, especially the giant ampersand!!! Peace, love & joy...I love the sentiment and your card. This is so pretty, love it!! It is such a simple card and yet shows so much technique. Very pretty! I love to emboss on white cards. So classic! Very nice card. This card is awesome. Love the embossed ampersand. Thanks for the inspiration. This is a really classy card. Love it. Very simple but a beautiful card. Love the embossing...a very sweet card! How sweet--I like the colors. Oh what a beautiful card!! I love the simplicity and its still so very elegant. Very Nice!!! Love those easy to mass produce cards!! Great card!!! Oh Wow - love this - totally awesome. Fantastic stamp and die set! Super card! Hero Arts FIRST blog post!